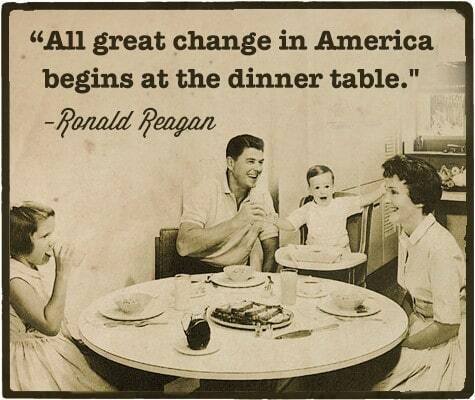 Reagan was a great champion of the power of family dinners, but a commitment to this tradition crosses partisan lines. President Obama has made family dinner an almost inviolable part of his daily schedule. No matter what is going on, at 6:30 he takes a break from work to sit down and eat with Michelle and their daughters. He’s made it a strict rule not to miss more than two dinners a week. This dedication is unusual, even among past family-oriented presidents, and sometimes gets in the way of diplomatic outreach and political back-slapping. “Sometimes Michelle and I not doing the circuit and going out to dinners with folks is perceived as us being cool,” he has said. “It actually really has more to do with us being parents.” Because his kids are relatively young, catching up with them every day is a priority. If the POTUS has time for a nightly family dinner, you do too. Here’s why you should make family dinners a priority as well, and how to get the most out of the daily tradition of breaking bread with your kin. 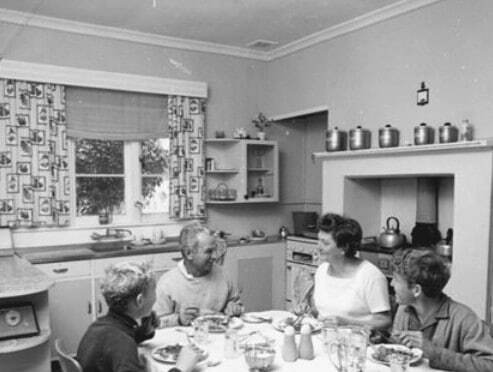 The importance of regular family dinners has been a hot topic in the world of sociology and family studies, and you’ve probably seen many articles these last few years touting their benefits. It’s been argued that family dinners do everything from decrease obesity to lower your children’s risk for teen pregnancy, crime, and drug use. It seemed as though family dinners were a silver bullet in preventing your kids from becoming deadbeats, and a failure to regularly sup together pretty much destined your child for a life on skid-row. However, when researchers recently took a closer look at the supposed benefits of family dinners, what they found was that a lot of them could be chalked up to correlation rather than causation. That is, parents who had a strong marriage, better relationships with their kids, and set more guidelines for them, were more likely to have family dinners, and more likely to have well-adjusted children. It is these other factors, rather than the dinners themselves, that account for this effect. The study’s authors concluded that while family dinners alone won’t prevent your kids from turning into cigarette smoking, teen mom juvies, the ritual can serve as a valuable part of a set of family habits, routines, and practices that contribute to a child’s overall well-being. One clear benefit of family dinners that they found held up, even when controlling for the other factors, was a significant reduction in adolescent depression. So consider family dinners to be another tool in your goal of building a positive family culture. Their real benefit is the chance they provide for your family to slow down, get together face-to-face, talk without distractions, cement your values, create a feeling of support, and build loving bonds. These benefits accrue to families who not only try to regularly have dinner (or another meal) together, but who approach these chances to break bread in an intentional way. Here’s how. Strive for consistency. 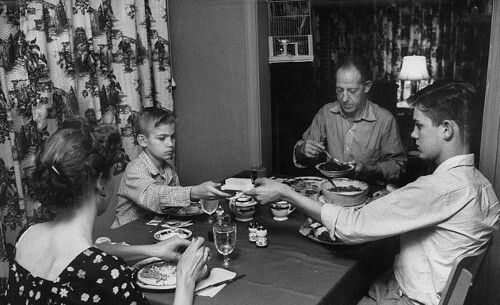 Try to make family dinner a sacrosanct ritual. Whenever you can, schedule your work and activities around this immovable block. Sometimes very busy high-powered executives will come home from work, eat dinner with the fam, and then go back to work later. They do what they can not to miss it. What’s great about prioritizing family dinners is that it gives you a goal to shoot for. If you know the wife and kids won’t be sitting down together and will just be fending for themselves, it’s tempting to rationalize continuing to plow through your work. But if you’re expected to be at the table, it’s easier to break away from what you’re doing and get home. Don’t beat yourself up if you have to forgo your family dinner sometimes. Research indicates that children who have dinner with their family at least three times a week enjoy the benefits of family dinners. So just try to be as consistent with it as you can. It doesn’t actually have to be dinner. Many families today have schedules that make it hard to get everyone home for dinnertime. Dad or Mom works late, and one kid has soccer practice at 6PM while the other kid has a piano recital on the other side of town at 7. It only gets worse as the kids get older. I remember when I got into high school, I was barely ever home for family dinner due to football, work, or student council. Sometimes the solution is a much-needed simplification of our schedules, but it’s just not always possible to get everyone to the table at 6:00. Because of this, many families simply give up altogether on the idea of regularly sharing a meal. But research shows that when it comes to the benefits of breaking bread as a family, there’s nothing magical about doing it at dinnertime. It’s just as beneficial to sit down together for other meals — breakfast, lunch, even dessert! The key is that you’re together as a family on a regular basis (food helps in this by adding a level of comfort, texture, and enjoyment). Maybe evenings are crazy for your family, but mornings not so much. Make family breakfast your thing. Let’s say mornings and evenings are bad, but things are pretty chill right before bedtime. Make time for a pre-bed snack as a family. It could be cookies and milk, or if you’re paleo, try some coconut blueberry balls. The important thing is that you get together with your family on a regular basis for some quality conversation and bonding time. So instead of thinking about making the most of family dinnertime, think of it as getting the most of family meal times. Get your kids involved with making the meal. Kids love to help out with cooking. And letting them do so will help them forge a better appreciation of food and teach them a valuable skill in self-reliance that will really come in handy once they head out on their own. Plus, it gives you a chance to start talking to your kids before you even get to the table. Take-out (or dining out) is a-okay sometimes. Home cooking is ideal for reasons of both health and cost, but there are always going to be times where you or your wife don’t have time to make a meal from scratch. That’s okay – remember, the important thing is just making the time to sit down together. Getting take-out or going to a restaurant can actually be more relaxing for everyone, and the latter is a lot of fun for the kids. No TV, cellphones, or tablets. The purpose of family meal times is to strengthen the familial bond. You can’t do that when you’re all silently staring at the TV or while everyone has their eyes glued to their phone. Make it an ironclad rule: no electronic devices at the table. Play music in the background. This is something we do in our house sometimes. We often play big band or classical tunes, and I try to teach Gus the sounds of the different instruments. If we’re eating Mexican food, I’ll put on some rock en español — Maná and Juanes are two of our favorites. If Kate’s the DJ, it’s often the Guster channel on Pandora. Some quiet background music adds to the atmosphere and just makes the occasion feel a little more special and fun. Teach manners. Shared meals are the perfect time for teaching your kids manners. It’s something you have to reiterate over and over and over again with the little ones, but ingraining this ritual will help them cultivate a civil and polite mindset that will extend far beyond the dinner table. Practice the 10-50-1 Rule. To get the most out of family meal times, you need to get your family talking. And not just about whether the food is too spicy (research has found that most conversation at family meals centers on the quality of the food!). 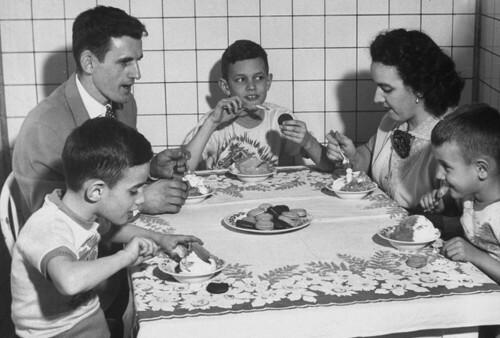 In his book, The Secrets of Happy Families, author Bruce Feiler shares a guideline he uses for family meal times: the 10-50-1 Rule. Aim for 10 minutes of quality talk. Researchers have found that’s about the average amount of quality talk time an average meal yields, so it’s a good minimum goal. It’s not much, but a little bit each day on a sustained basis really adds up over the long haul. Let your kid speak 50 percent of the time. Research shows that adults usually hold the floor for 2/3 of that 10-minute conversation time. There are benefits for kids in overhearing adult conversations, but you want to hear what they have to say, too. Teach your kids 1 new word every meal. Studies indicate that kids who have regular family meal times have larger vocabularies than kids who don’t. But holding regular family dinners won’t magically teach kids new words. Be intentional about it like Bruce is. At every dinner he teaches his kids one new word by playing different games. For example, he’ll throw out a word like “fruit” and then have everyone come up with as many related words as possible. Another game he’ll do is to bring a newspaper to the table and have everyone find a word they don’t know, try to figure out what the word means, and discuss it with the rest of the family. Get good conversation going. If you want to have at least ten minutes of quality talk at each meal, and you want your kids to do half of the talking, you’re going to have to ask them questions. Sometimes kids will give you one-word or non-answers, but just keep trying to elicit a response from different angles. Don’t just ask, “How was your day?” Ask them to tell you one thing they learned that day or what the best part of their day was so far. Ask them if they saw or read anything interesting. As they get older, bring up current events and ask for their opinions on them. Do you know of an illness or something really terrible that happened in your family? Duke and Fivush believe that knowledge of his or her personal family history provides a child with a strong “intergenerational self,” which makes them feel like they’re part of something bigger than themselves. As they hear stories of family struggles and triumphs, kids learn about family narratives that instill resilience. According to Duke, the most powerful narrative for building resilience in children is the oscillating narrative. It’s basically the story of continual ups and downs in your family, where, despite what happened, the family always stuck together. How empowering and inspiring is that for a kid who’s going through a tough time? Knowing that great-great-great grandpa managed to create a thriving business even after suffering hardship and the death of family members along a wagon trail in the middle of nowhere can help a kid understand that life will be okay even if he doesn’t get into his college of choice. If grandpa thrived during adversity, he can thrive, too. I plan on dedicating a few posts on getting started with family history and genealogy, but for the time being, start talking to your kids at the dinner table about the family history you do know. If you’re not sure where to get started, use Duke’s list of questions he uses to test children on their knowledge of their family history. What’s your advice for getting the most out of family meal times? Share with us in the comments!